Rewind to a convo my ah-mazing FIL and I were having a few months back when his son and I moved into my SIL’s guest house about a table solution for the kitchen as the space is pretty narrow. (My hubby is going all cray cray on remodeling our new (old) house so I knew he wouldn’t have the time to build me anything.) To my surprise, my FIL showed up within a few days of that convo with a freshly built dinette table that fit perfectly in the space. Sneaky sneaky Hank. I sure love that guy and his super furniture building skills (remember the custom Land of Nod knock-off crib he built for us last year? He has some serious talent!) Anyway so now I had a kitchen table (painted a shabby yellow) with no place to sit. I scoured Craigslist for barstools with no luck and was not about to load my little kids in the car for the hour drive to Flagstaff to hunt for stools at retail prices. 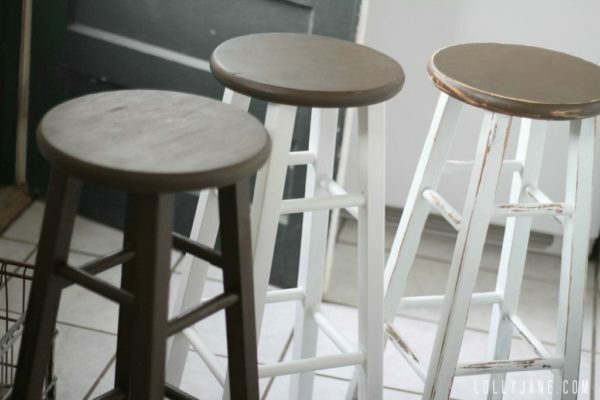 My BIL came to my rescue with 3 barstools he no longer needed…. for free! Score! Fast forward to the picture below… the most expensive item in this space are my Hunter rain boots I got from an IG deal site. Now we know the proper definition between being cheap and frugal (; Haha! …loving the after! And no, those floors weren’t part of the redo- that’s just a cool backdrop I scored from Very Jane (; Anyway it was a super easy process, albeit a bit time consuming because there were a few steps involved x3 barstools. To get started I peeled off the vinyl logos, wiped the barstools clean and sanded the heck out of them to get the all of that shiny poly finish off. 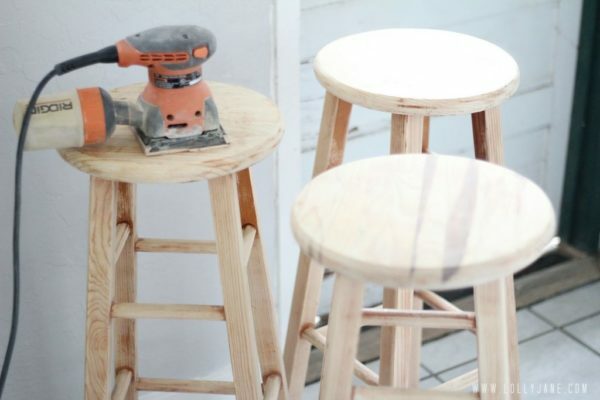 Don’t skimp of sanding! Paint adheres best to unfinished wood. See how clean and fresh they look now? Don’t be afraid to take a hold of furniture and make it yours! 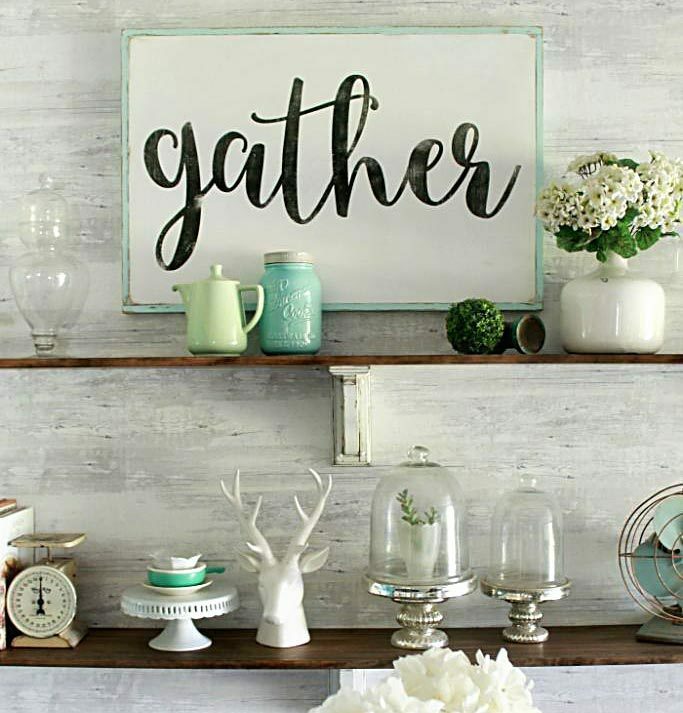 Painting is the easiest and cheapest way to really personalize a space. What a difference between the before and after with minimum effort. Love that. Looks so cute Kelli! I can’t believe he made that table, it’s seriously awesome. 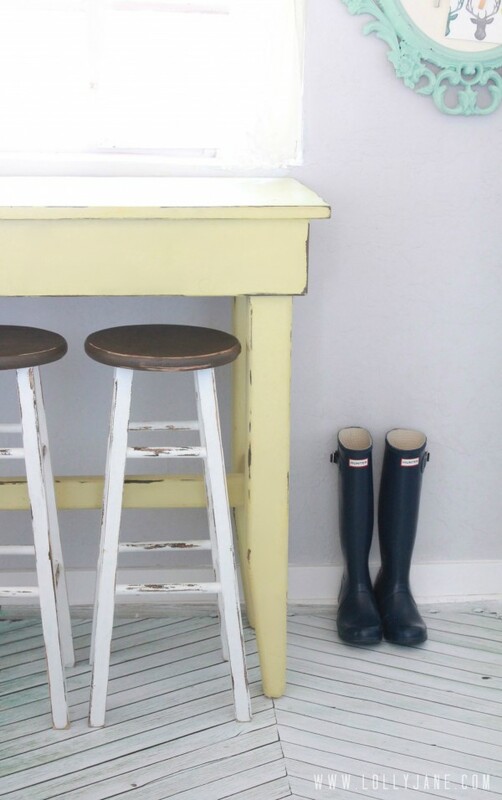 Love the stools too. Uhm, duh…I mean to say “looks so cute KRISTI!” ha ha, I’m a dork. Bar stools turned out great!! 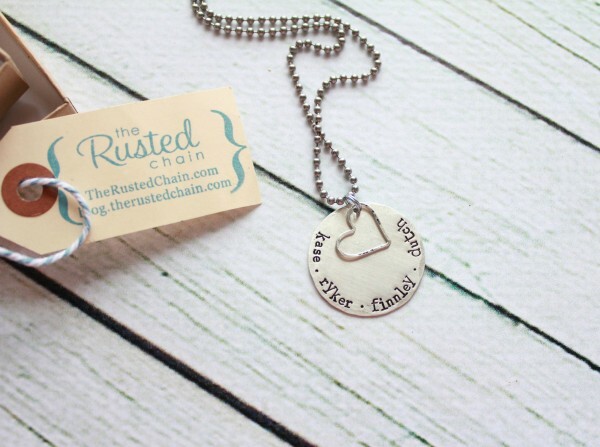 I love the distressed look! So cute!! I love that little photo prop! Your FIL is awesome to build the table!! Hi! 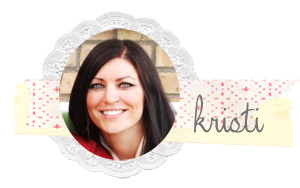 I just found your blog – thank you Pinterest – and I love it! 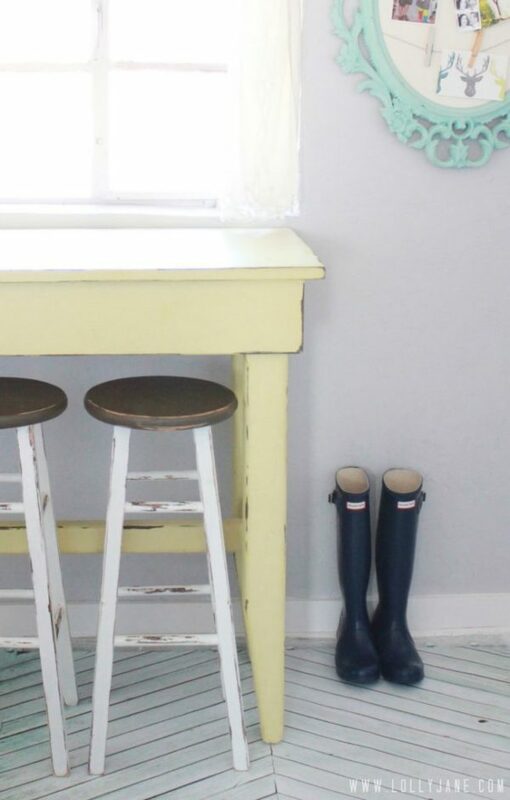 I noticed the wood strip flooring in this post and would love to know more… have you done a post on it? ha ha, oh that is so funny! My biggest fear is to be on live tv… I have no idea what could come out of my mouth… so scary! What an amazing transformation, Kristi! 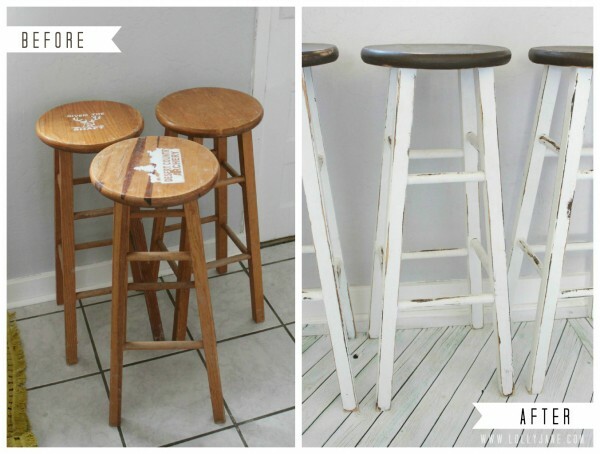 You can barely tell the before and after stools are related…. The barstools are great!! And, I’m loving the pop of yellow on your table. Gorg! I’ve pinned this! LOVE, LOVE, LOVE! You’ll be linking this up today, right????? Great job! Love the colors. I need those to go with my table – same color. Our bar stools are getting wobbly. New ones are a lot of money and they don’t look as good as yours. I looove these and am so glad you gave a tutorial on them! This type of furniture is all the rage in furniture stores right now, and they want hundreds of dollars for it. I think I’m going to give this project a try myself. 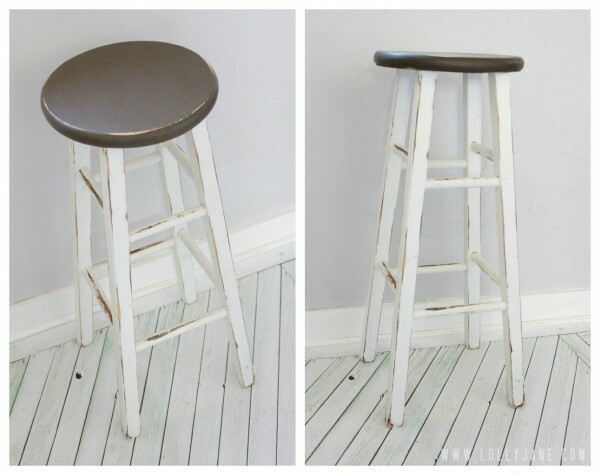 We’ve been looking for barstools for almost 3 years now, and these would look great in our kitchen. Thanks ladies, y’all are so crafty! Love the way it turned out. You did an awesome job. Now i find inspiration to deal with my old furniture. Thanks for sharing this furniture makeover DIY.